This coming Secretaries Week, otherwise known as Administrative Professionals Week (April 25-30, 2016), show heartfelt appreciation to secretares by taking them out to for a sumptuous buffet at One-Ninety or an exquisite set menu at Jiang-Nan Chun at Four Seasons Hotel Singapore. As a token of their hard work and dedication, all secretaries who dine at One-Ninety and Jiang-Nan Chune will receive a L’OCCITANE gift pack,* containing L’OCCITANE bath salt, soap and eau de toilette during this celebratory week. With a recently refreshed menu featuring new mains such as slow-cooked kurobuta pork belly, grilled Spanish octopus, petit yellow “coquelet” spring chicken and many more, visit One-Ninety to savour ocean-fresh seafood and masterfully grilled meats. The sumptuous mezze buffet includes an appetiser and dessert buffet plus a selection of one main course served à la minute. For reservations, call (65) 6831 7250 or email one-ninety.sin@fourseasons.com. Known for its exquisite Cantonese cuisine, secretares can be treated to a delectable fiver-course Oriental set menu at Jiang-Nan Chun, featuring handcrafted dim sum to mesquite wood-fired roast meats. 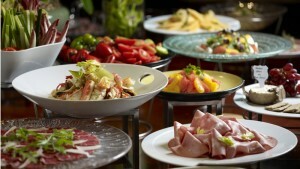 Select from two carefully curated set menus at SGD 88 or SGD 108 per set. Set in the newly renovated restaurant, this is the perfect treat for tireless assistants. For reservations, call (65) 6831 7220 or email jnc.sin@fourseasons.com. *While stocks last and reservations required. Prices are subject to 10 percent service charge and applicable government taxes.